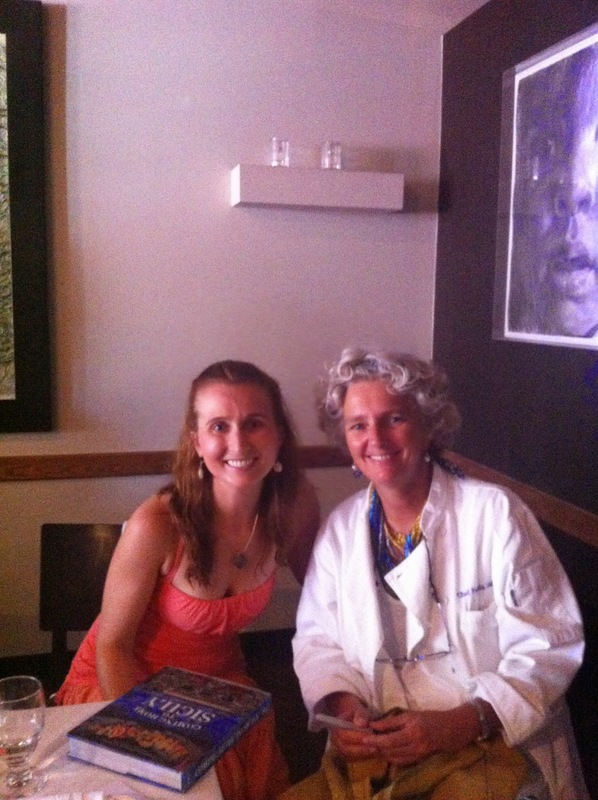 Last summer, I took a cooking class with Fabrizia Lanza. Fabrizia Lanza runs a cooking school on one of the oldest and largest estates in Sicily. This estate also includes her family's Tasca d'Almerita winery (try their Rose!). Fabrizia wrote a beautiful cookbook sharing her generation to generation Sicilian recipes while opening the door to her family estate and the cooking school. Cooking with Fabrizia, Frank Bonanno (an incredibly talented chef and owner of several restaurants in Denver), and other equally excited individuals in Luca d'Italia's kitchen made for one fun afternoon. When I flipped through Fabrizia's cookbook, I saw a recipe for cassata, and come spring, I knew that I would be making it. Why spring? Well, it just feels like a spring-like dessert with the candied fruit and ricotta filling. As strange as it may sound, some foods just feel seasonal to me. Cassata also had been on my baking bucket list for a very long time. The presentation of this cake always intrigued me because there are few cakes garnished with candied fruit and wrapped in marzipan. Truth be told, I don't actually ever remember trying cassata, but I was sold knowing that there was a sweet ricotta filling. Sweet ricotta reminds me of cannolis. "Leave the gun, take the cannoli." Right? Right. This was a very involved cake to make, but it really breaks down to four phases: cake baking, filling making, marzipan creation, and assembly. The cake is a moist sponge cake, made with just eggs, flour, sugar, and some lemon zest. It's moist but also light with a hint of lemon. Layered between the cake is a sweet, creamy ricotta filling. Need I say more? I didn't think so. The cake is wrapped in marzipan, which is a confection made of almonds, pistachios, confectioners' sugar, and honey. I loved that Fabrizia encouraged homemade marzipan for this. :) I just blended the ingredients in my high powered blender, which made it a snap. And, the cassata successfully inverted onto the serving plate without anything crumbling and falling apart. (Thank you, lucky limoncello shot.) After inverting the cake, I glazed the cake and layered some candied Meyer lemons and blood oranges on top. For the cake: Preheat the oven to 350ºF. Grease and flour 9-inch round springform pan, and set aside. In the bowl of a stand mixer, or using a large bowl with a hand mixer, beat the eggs until a pale yellow, about 5-7 minutes. Add the sugar and lemon zest, and continue to beat until the mixture has thickened with ribbons forming when you lift the beaters, about 15 minutes. Then, gently fold in the flower. Pour the batter into the pan and bake for about 25-30 minutes, or until a toothpick inserted into the cake's center comes out cleans. Transfer the pan to a cooling rack and allow to cool. For the cream: In the bowl of a stand mixer, or using a medium bowl with a hand mixer, beat the ricotta and sugar together until light and fluffy. For the icing: Whisk the confectioners' sugar with lemon juice. To assemble: Line a 9-inch round cake or springform pan with plastic wrap. Line the sides of the pan with the marzipan strips, pressing together at the seams to make one continuous band. Trim any excess. Cut the cake crosswise into 1/2-inch thick slices. Line the bottom of the pan with a layer of cake slices, trimming to fit. Drizzle 2 tablespoons of limoncello over the cake. Spread the ricotta cream evenly over the cake. Carefully top the ricotta cream with another layer of cake slices. (You may have leftover cake.) Drizzle with the remaining 2 tablespoons of limoncello. Next, take a large serving plate, and invert the cassata onto this plate. Carefully lift off the pan and peel off the plastic wrap. Pour the icing over the top of the cassata and smooth with a spatula. Decorate the top of the cake with candied fruit. Refrigerate for about 2 hours so that the cake can set. What a beautiful recipe. I don't know what impresses me more the whole cake or the homemade marzipan. Gorgeous presentation. This is a slightly unusual (but delicious) presentation with a green icing and blood oranges on top. What a great class! (It sounds to me like the class was held in Siciliy)? What a presentation! So colorful. And I can only imagine how proud you are of yourself for making this. This is my husband's 2nd favorite dessert after profiteroles. I would have loved that class AND the cassata!